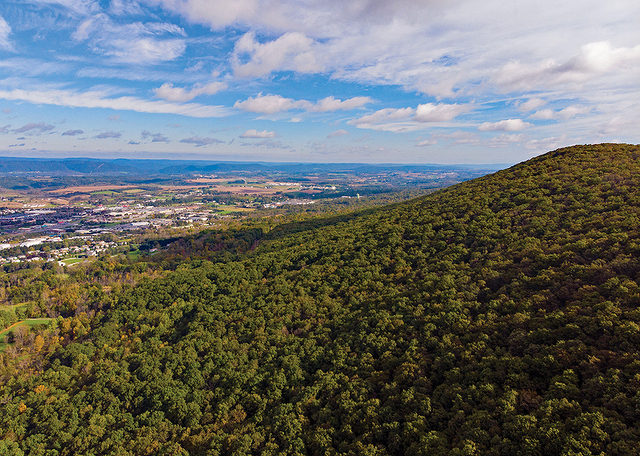 (Nittany Aerial Photo and Video) Mount Nittany overlooks the Valley below. (Photo by Darren Andrew Weimert) Jeffrey and Jessica Miller enjoy a moment atop Mount Nittany. Every Saturday in the fall, they call your name on college football broadcasts around the country. During home games, they show your beauty in the distance from far above Beaver Stadium as a symbol of what makes Happy Valley so special. While you may not be the tallest mountain in the world, in your shadow sits a town and a world-renowned university that look up to you. Penn State World Campus has students all around the globe, but they all identify as Nittany Lions. Downtown State College keeps building up with high-rises that push to the sky, but they all sit well below your impressive vistas. Around town, your name is everywhere: on billboards, trucks, shirts, businesses, churches, schools, even a medical center. On weekends and afternoons, the cars line down the streets at your trailhead, and students, community members, and visitors from around the world hike your trails to see your wildlife and enjoy your views, and to share the pride in your natural beauty. The legends says you were named after a Native American princess, but no matter where your name comes from, when people think of State College, Pennsylvania, and Penn State University, they also think of you. After all, what really is a Nittany Lion but a typical mountain lion that roamed on your ridge? To most every Penn State Nittany Lion out there – and there are a whole lot of them – you remind them of their glory days, when they were young and the sky was the limit. You are their North Star, their barometer. Traveling down Route 322 or Interstate 99 for a football weekend, Penn Staters know they have made it back “home” when they see you in the distance. There is whole group of people out there protecting you, conserving you, hiking you, and keeping you open to the community. You are a part of our pride, and people take you with them where ever they go, because in the shadow of Mount Nittany is a place to always call home. Seventy-three years ago, they were going to log Mount Nittany. Long a symbol of the area, in 1945 the mountain was up for sale by the former land owners for potential timber prospects. A group of Penn Staters from the Lion’s Paw Alumni Association could not bear to see their beloved Mount Nittany be desecrated, and started a campaign to save 525 acres of the mountain. They did it. But the fight wasn’t over. The trails, with maps, signs, and trail markers, are all part of the hard work of the Mount Nittany Conservancy. Consisting of a large group of volunteers, the conservancy keeps the mountain open and accessible to the public. Sure, the trails heading up the mountain are steep and sometimes rocky, but even first-time hikers should be able to follow the paths and maps that the conservancy provides. 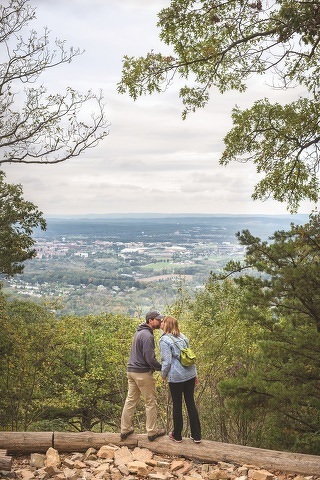 Experienced hikers, families, people who have never been on a trail before, can all enjoy Mount Nittany because of the work the conservancy has put into it. Having grown up hiking Mount Nittany as a State College native and Penn State grad, Eric Loop now serves as president of the Mount Nittany Conservancy board of directors, which has been in charge of overseeing the land that we know as Mount Nittany since 1981. The conservancy has developed a 10-plus-mile system of trails – appropriately a Blue Trail and a White Trail – that take hikers up and around the mountain with the help of volunteer groups. Maintaining the grounds is no easy feat. With the high traffic the mountain sees, erosion is a constant issue. It is 0.7 miles of climbing on the White Trail to the popular Mike Lynch Overlook, a trek up that most can complete in 30 minutes or less. On nice days there are bound to be hikers coming up and down by the boatload. The trail is tough; hikers earn their way to the top of the climb, 600 feet higher than where they started, but they are rewarded with a view that stretches across the Penn State campus to the other side of the valley. It is amazing to see Penn State from these heights and to watch the sunset over the mountains to the west. A hiker can point out Beaver Stadium, Old Main, and the Bryce Jordan Center from a perch among the clouds. The conservancy relies mostly on volunteer groups to help maintain the trails, but in 2017 the conservancy spruced up the overlook with the help of Glenn O. Hawbaker Inc. to keep it accessible in the future. The project is a good example of the distinction between conservation and preservation, Loop says. While the White Trail leading up to the Mike Lynch Overlook may be the most popular spot on the mountain, there is a network of trails leading out to the rest of the conservancy’s land, open to hikers and explorers looking to get away from the crowds. The Blue Trail leads a longer loop around the mountain and provides hikers with views from seven different overlooks. The way the mountain juts out into Happy Valley, hikers who travel around the whole mountain can get the breadth of the area, with views of Boalsburg, Penns Valley, the Spring Creek Water Gap, Rockview penitentiary, and Bellefonte. With many options, loop hikes can go from 2.5 miles to more than 5 miles, with hikers always finding something new on the trails less traveled. Hikers can go for miles without seeing a person. Loop says a hope for the future is to provide a possible secondary trailhead up to Mount Nittany to ease some of the traffic on the White Trail. Back in 2016, Kate Clarke saw Mount Nittany as the perfect challenge. She wanted to get back in shape and she always loved hiking, so she made a pact, along with her friend Sandy Miller, to hike the mountain 100 times. The Nittany 100 was born, with a Facebook page to share their story. It was perfect for Clarke because Mount Nittany is right there, a short drive from her office on campus, with the trailhead just up Nittany Mountain Road in Lemont. Over a lunch break, before a meeting, or after a long day at work, Clarke could get out and get away from it all. Soon she realized that while the mountain was helping her get her trail legs back, she was gaining much more than physical health from her endeavor. What began as a hiking challenge turned into something akin to ownership. Soon, Clarke and Miller started carrying trash bags as they hiked, cleaning up trash left by thoughtless hikers. They believed they could make a difference, educating and setting an example for all those who use the mountain, that it is everyone’s responsibility to keep it beautiful. For Rik Harris, finding Christmas presents for his adult children has always been difficult. When they were young it was easy, but when they grew up he still tried to find something that made them smile like children. A few years back he came up with a great idea for the two Penn State graduates. He got them a piece of Mount Nittany to call their own, even if it was just a square inch. The conservancy offers this opportunity – largely symbolic because, after all, it is only an inch of the mountain – to give any Mount Nittany lover a sense of ownership. Long a curiosity for many a hiker, a house sits at the base of the trailhead starting up Mount Nittany. It used to show unwelcoming signs, reminding hikers that the land was private property. Lenore Loerch raised her four children in the old house, and her son Dan remembers spending a childhood exploring the mountain, its streams, and its wildlife. The house has sat empty for years, but now the family wants to give back to the community and the mountain they love by turning it into an education and visitors center called The Nittany House, where hikers can gather and learn together about the mountain and surrounding area. The family is working on establishing The Nittany House as a nonprofit, separate from the conservancy. They hope to raise funds and fix the old house back to its farmhouse glory, turning it into an education center along with a parking area and public bathroom for hikers. Already a more welcoming atmosphere is present at that house by the trailhead, with a picnic table and sometimes a map and flags that allow hikers to identify where they come from, showing the diversity that is drawn to the mountain. After dinner on Thanksgiving Day 2012, Dean Lawrence’s son asked him to hike up Mount Nittany, and Lawrence thought it sounded like a good way to get a little exercise. Halfway up, taking a break on a bench, he was somewhat hoping that his son would decide to head back down and call it a day, but the little guy wanted to make it to the top, and Lawrence wasn’t going to let his son down. When they finally made it to the overlook, Lawrence couldn’t believe the view. “I said, ‘How did I not ever come up here? It is amazing,” says Lawrence. So then he started climbing that mountain as often as he could in the heat of summer and amid the ice and snow of winter. He lost 70 pounds and became much happier and healthier. Having hiked that mountain more than 750 times since then, it is safe to say he has seen it all, including bears, snakes, turkeys, porcupines, turtles, and deer. J.D. 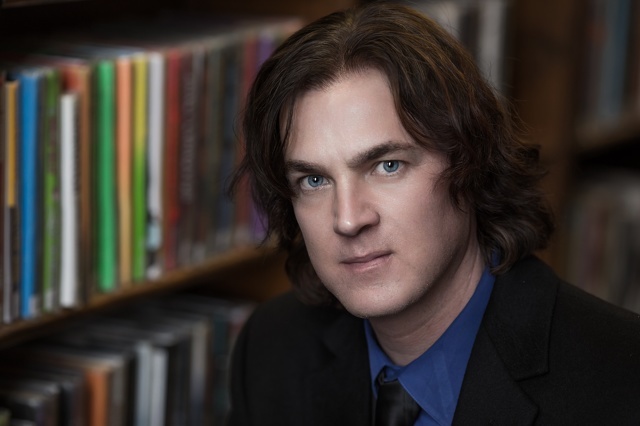 Barker, the bestselling author of thrillers, will give a presentation at 6:30 p.m. Tuesday at Schlow Centre Region Library. The event, presented by the Nittany Valley Writers Network and the Schlow Foundation, is free. Book sales and a signing will follow. Barker’s visit is part of Global Entrepreneurship Week Penn State. This has been quite the year for Barker.